1 pc chain pendant. Material: Alloy. Pendant Size: About 5.5 2cm. Chain Length: About 62cm. NOTE: the product in the picture maybe larger than actual one. hope you could understand. High quality in EU and US quality standard. Punk Womens Charming Alloy Crystal Music Note Sweater Pendant Necklace Chain New. Package content:1 pc chain pendant. Material: Alloy. Pendant Size: About 5.5*2cm. Chain Length: About 62cm. Color: Silver Material: Alloy Chain length: 32cm Pendant size: 6.5 X 2.5 cm Gross weight: 13g Package include: 1 X Necklace Note:Light shooting and different displays may cause the color of the item in the picture a little different from the real thing. The measurement allowed error is /- 1-3 cm. Brand Unbranded MPN Does not apply UPC 191466204382. Material: Alloy / Rhinestone. 100% new and high quality Necklace Length: 70cm (27.5 "). You may also like. Suitable for any color or style of clothe. Color: Silver Material: Alloy Chain length: 32cm Pendant size: 6.5 X 2.5 cm Gross weight: 13g Package include: 1 X Necklace Note:Light shooting and different displays may cause the color of the item in the picture a little different from the real thing. The measurement allowed error is /- 1-3 cm. Brand Unbranded MPN Does not apply UPC 4894462799239 EAN 4894462799239 EAN 4894462799239. 100% new and high quality Necklace Length: 70cm (27.5 "). Pendant size: 8.5cm x 3cm. Suitable for any color or style of clothe. Lead free, cadmium free, and nickel free . Crafted and encrusted by genuine crystal rhinestones . Material: Alloy / Rhinestone. 100% new and high quality Necklace Length: 70cm (27.5 "). Suitable for any color or style of clothe. Accordion Music Instrument Necklace 18 inch long chain to fit most ladies Free USA shipping. Pendant size: 1 1/2" x 1 1/4". -Total chain length: 35". You may also be interested in. Necklace length 70cm (27 "). Pendant size: 9cmx3cm. pls kindness understand and wait patiently, Pls make sure your. We will send you a new one after we receive the defective item. Material: Alloy /Rhinestone. Color Silver / 18 " Chain Necklace w Parrot Clasp. Silver Bass Guitar Music Necklace. Also a great graduation or teacher gift. Great gift for the guitar lover in your life. Pendant size: 6.5 X 2.5 cm. Note:Light shooting and different displays may cause the color of the item in the picture a little different from the real thing. Special logo design: Fashion Snowflake Paved Blue Crystal Charm for DIY Jewelry Making Necklace Bracelet Earring, which highlight your personality and uniqueness. The pendant size is about 15.8mm 20.5mm (0.62" 0.80"), weighing about 1.4g (0.003lb). The material is zinc alloy, eco-friendly made, nickle and lead free，hypoallergenic. It’s openable, can be screwed open. - Pendant Size(L x W x H): Approx. 1 Piece Pendant. Pendant Size:25mmx30mm Approx. Because, our prices are unable to include above fees, as the custom policies are different in every territories. But, we'd like to assist you to receive the goods smoothly if there are anything we can do here. Color Silver / 18 " Chain Necklace w Parrot Clasp. Style Pendant. Main Stone crystal. Color Gold. UP FOR SALE IS A GORGEOUS MUSICAL NOTE SWEATER PENDANT ON A 3mm ROLO LINK CHAIN NECKLACE. Alloy musical note sweater pendant with polished gold finish and white crystals. Necklace thickness: 3mm. Necklace length: 65cm (25 1/2"). UP FOR SALE IS A GORGEOUS MUSICAL NOTE SWEATER PENDANT ON A 3mm ROLO LINK CHAIN NECKLACE. Alloy musical note sweater pendant with polished silver finish and white crystals. Necklace thickness: 3mm. Necklace length: 65cm (25 1/2"). 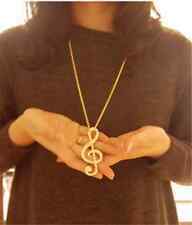 1 x Music Note Necklace pendant. Material: Alloy Crystal. Pendant size:About 5.5 2cm. Necklace length: App. 62cm / 24.5'. High quality in EU and US quality standard. Round pendant size: 11.03in(28mm) by 9.26in(23.5mm); Music-note size: 14.18in(36mm) by 4.73in(12mm). You are getting aClear MUSIC NOTE Pendant with Swarovski crystals. 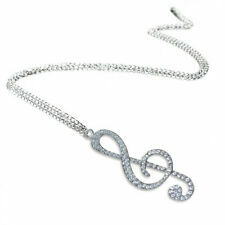 Simulated DIAMOND /Austrian Rhinestone clear MUSIC NOTE Pendant with Swarovski crystals& 18" Silver Finish Snake Chain Necklace. The crystals of this finished product are being manufactured by D. Swarovski & Co.
Silver Crystal Music Clef Note Necklace Plated Musician Music Teacher Gift 17"
The clef note is gold tone and dangles. Great gift for the musician in your life. 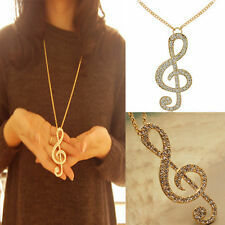 Two Tone Crystal Music Necklace. Gold and silver rhodium plating. freely on the staff. Simulated DIAMOND /Austrian Rhinestone TREBLE CLEF and BASS CLEF HEART Pendants with Swarovski crystals & two 18" Original Rhodium Plated Snake Chain Necklace. You are getting two separate necklaces that will create a heart form when you put them together. Musical Notes Red Crystal and Silver Necklace January or July 26" long. The red stones are similar to the January Garnet or the July Ruby. We buy NEW excess inventory or used tested components. Once we receive the hardware we buy, we verify the functionality of sample units using our test machines.